The word “Whiskey” is popular among rock bands. Some even get the spelling right. It evokes that hard drinkin’, hard livin’ ethos that rock’n’rollers once aspired to. Maybe some still do. 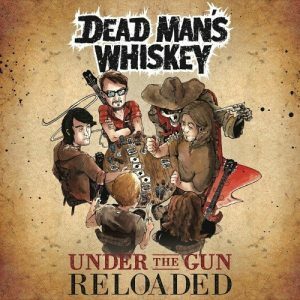 Dead Man’s Whiskey go a step further. The spoken word opening track, ‘The Ballad Of Jack McCall’ briefly tells the tale of the shooting down of legendary cowboy, Wild Bill Hickok. He was (allegedly) shot dead by fellow gambler, Jack McCall during a poker session, leaving his drink – Dead Man’s Whiskey – and his cards, 2 Aces, 2 Eights, aka ‘Dead Man’s Hand’ lying on the table. Surprisingly then, there is a distinctly Brit sound to this now remastered-and-expanded-by- two-new-tracks album, Under The Gun, Reloaded. It’s compact, seldom expansive and too often settles for sounding like they’ve copied and pasted their tunes and riffs from the Big Book Of Hard Rock and Heavy Metal. But what they lack in originality they make up for in sheer energy, passion and power. On the occasions when the music – rather than the performance – does make an impact, you can see glimpses of the hard rock band they could be. On ‘Live Loud And Ready’, Nico Rogers’ high toned vocals wail over a relentless, torqued up riff that peels away on the middle section to allow some classy twin guitar soloing to take up the slack. ‘Make You Proud’ is a touching, sensitively produced story of the circular nature of parental love, dressed colourfully in a mix of acoustic and cranked up axework, while the similarly arranged ‘My Year’ shows the band have taken the best of their influences – Tesla, Whitesnake, Zakk Wylde – and delivered a carefully gilded, and very satisfying hybrid of hard rock and heavy metal. That sense of momentum they started with on ‘Live Loud and Ready’ though is not really picked up again until we reach the two new tracks at the end of the album. Both of which are head and shoulders above most of the original tracks. The first, ‘Raising Hell’ has a looser, more organic sound. The clang and thump of guitars and drums, and a darkly textured axe solo convey a strong sense of menace and unease, while ‘Racing Bullet’s riffy axework and rhythmic lyrics combine to raise the temperature those vital few degrees. This song will be great live. Arguably then, these two tracks are the signposts to the future for the band. They might need to distance themselves from hard rock conventions, and become just that little bit more imaginative, as they have done with this more recent material.